Born in Indonesia of French parents, and brought up in Australia and France, Sophie Masson is the award-winning and internationally-published author of over 60 books for children, young adults and adults, published in Australia and many other countries. Among these are her bestselling historical novel for children, The Hunt for Ned Kelly(Scholastic Australia), which won the Patricia Wrightson Prize for Children's Literature in the 2011 NSW Premier's Literary Awards. She has also written four popular YA romantic thrillers under the name of Isabelle Merlin. Under the name of Jenna Austen, she has also published two romantic comedies for tweens and early teens. 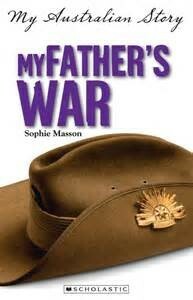 1914, launch title of the Australia’s Great War series (Scholastic 2014) set in Central Europe, France and Belgium, is the second novel Sophie has written about World War One, with the first being My Father's War, (Scholastic 2011) set in the Somme in 1918. She is currently researching material for a future novel set in World War Two. Sophie is currently undertaking a PHD in Creative Practice at the University of New England, in northern NSW. She is also one of the founding partners and co-director in small-press publishing house, Christmas Press, www.christmaspresspicturebooks.com, and its imprints, Eagle Books and Second Look. Annie’s dad has been away for two years, fighting on the Somme battlefields in northern France. For months there has been no word from him, no letters or postcards. Annie and her mother are sick with worry, so they decide to stop waiting-and instead travel to France, to try to find out what has happened to him. There she experiences first-hand what war is like, as she tries to piece together the clues behind her dad's disappearance. Will Annie ever see her father again? World War One had always been something of a blur to me before I started writing these books—it felt like so long ago and hard to understand. I knew quite a lot about World War Two, not only from books but because both of my parents were children in France during the German Occupation, and told us lots of stories about the actual lived experience of war. World War One to me was seeing war memorials in French villages and Australian small towns with lists of the dead and missing soldiers that went on and on. But as I started researching first My Father’s War and then 1914, I began to feel much closer to the people who had lived through this terrible war, and to understand a little more about the crazy sequence of events that sent the world into a catastrophic war that seemed impossible to stop…And doing the research on the ground, in northern France especially, made it all become so real and so emotionally affecting. Both books blend my two main cultural influences: French and Australian, and that also felt like a very positive thing, especially as the ties between France and Australia forged during that terrible time are still very strong, particularly in the Somme region of northern France, where they have a saying, N’oublions jamais l’Australie : ‘Let us never forget Australia’ . So many sad and tragic things in this terrible war! But something that really stood out for me was the fact that the event that triggered off WW1, the assassination in Sarajevo of the heir to the Austro-Hungarian throne, the Archduke Franz Ferdinand and his wife Sophie, happened almost by accident. In fact, there were several Black Hand terrorists in Sarajevo that day and a bomb had already been thrown at the Archduke but had missed…the bomber had been captured and all the others had scattered. The Archduke had insisted on carrying on his tour of the city—then the driver took a wrong turn down a street, the car stalled in front of a café and as the driver tried to restart the car, a young man who had just finished his lunch came out of the café, pulled a gun from his pocket and shot the Archduke and his wife at point-blank range. That young man was Gavrilo Princip, a Black Hand member who had given up on his mission: until the car stalled in front of the café and he saw who was in it. A tragic twist of fate indeed. 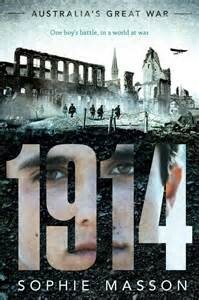 When you think of the way WW1 was conducted, you tend to think of trench warfare, with all that entails. But the war started and finished outside of the trenches—in the early part of the war, in 1914, armies faced each other across open ground and in the last parts of the war, in mid-late 1918, trenches were abandoned for more guerrilla-like tactics in woods and in townships. Trenches began to be used in late 1914, at least on the Western Front (they were never really a feature in the Eastern Front) as protection for soldiers because the new heavy weapons decimated troops on open ground. It was thought more lives would be preserved that way—which seems ironic to us now of course. In the last part of the war, military strategy had changed and trench warfare faded away, replaced by more targeted guerrilla-style attacks using woods and buildings as cover.